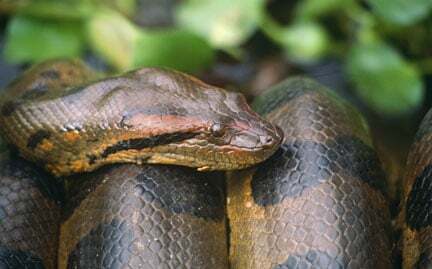 Anacondas comprise four species of aquatic boa inhabiting the swamps and rivers of South America’s dense tropical forests. Feeding on large rodents, capybaras, tapirs, peccaries, deer, fish, turtles, birds, sheep, dogs and caiman, anacondas are non-venomous and rely upon their enormous size and strength to overpower their victims. These ambush specialists are currently at risk due to deforestation and capture for pet trade.